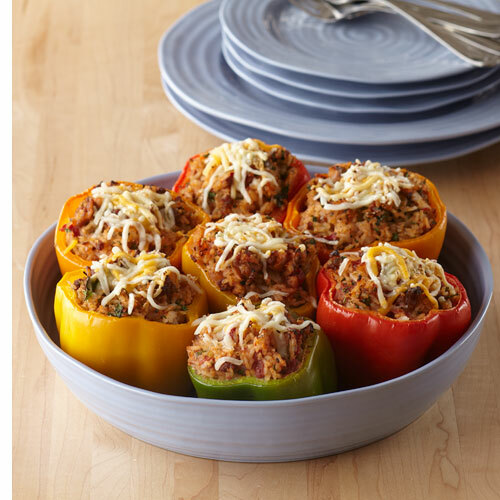 Preheat oven to 350 degree F. Grease a baking dish that the 6 peppers can fit into. Remove tops, seeds and membranes of each pepper. Parboil peppers in boiling water for 5 minutes. Combine the cooked rice, black beans, browned sausage, salsa and green onions. Season with salt and pepper to taste. Fill each pepper with rice mixture and place in baking dish. Bake 30 minutes or until the peppers are tender. Sprinkle cheese over each pepper. Return to oven and bake 10 minutes or until the cheese is melted. Serve hot.